The Joint Opposition is now split into several political factions, Development Strategies and International Trade Deputy Minister Nalin Bandara Jayamaha said, at a press briefing at Sirikotha yesterday. “We hear that Gammanpila and Basil Rajapaksa had a serious argument with each other recently. According to the sources, it was a serious verbal duel. These people cannot maintain their integrity. It is obvious that they are falling apart. They are not stable and they have their own factions,” he said. Deputy Minister Bandara also said if someone wants the government out, they can easily defeat the upcoming Budget 2019 in March. “If someone wants to topple the present government they should seek constitutionally correct ways to do so,” he said. “Just because we have some disagreements with the President, that does not mean that our government will cease. So if someone wants to topple the government, they will have to follow legal ways of doing so. Having press conferences everywhere won’t achieve that. But it is obvious that the Joint Opposition cannot keep themselves together as one team,” Deputy Minister Bandara said. 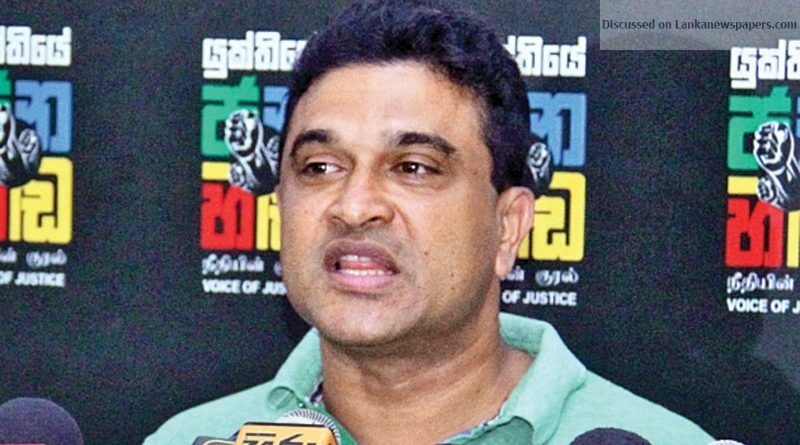 Asked about the recent revelation made by State Minister Ranjan Ramanayake of MPs using cocaine, Deputy Minister Bandara urged the State Minister to reveal the names of those MPs. “Even our families are in a difficult situation. So the best that State Minister Ramanayake could do is to reveal these names. At the beginning, the Joint Opposition including Wimal Weerawansa made a major fuss about this matter. But when our State Minister said only two MPs in the UNP use cocaine and two of the four MPs in Weerawansa’s party use cocaine, they immediately shut down their protest. I think it is much easier to find out the two people out of the four members of Weerawansa’s party,” he said. Deputy Minister Bandara also said that US$ 1 billion–worth project featuring a new steel factory under a joint agreement with Singapore and China will begin its construction by April 2019. Meanwhile, he demanded JO MP Weerawansa to first speak about the 18th Amendment to the Constitution before starting to criticise the 19th Amendment. “I am sure Weerawansa is not happy about the 19th Amendment as their political coup was unsuccessful because of the strength of this Amendment. It is ironic that the Rajapaksas now claim the Constitutional Council has become politicised. Initially we proposed that the CC consists of only three politicians. But it was the Rajapaksa faction that demanded seven politicians in the CC, and now they are telling us the CC is politicised,” Deputy Minister Bandara said. Asked if President Maithripala Sirisena is readying himself for the next Presidential Election by waging a war against drugs, Deputy Minister Bandara said President Sirisena has every right to run for the next Presidential Election. “Now, the Rajapaksa faction is trying to abolish the Presidency in order to gain an advantage. The position does not matter to us. We are ready to compete for any position,” he said. Asked on the recent incident where a police officer was overrun by a vehicle which was driven by a son of a politician, Deputy Minister Bandara said that the police need to take necessary action against the culprits without considering any other influence.